Welcome! 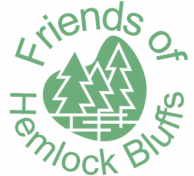 There are many ways you can get involved with the Friends of Hemlock Bluffs. Click on the links below for more information about purchasing an engraved paver and volunteering. FOHB members receive a 10% discount on nature programs. Make a donation! Click the Support Us button at any time to make a monetary donation of your choice. Want to make a donation, but don't want to receive updates and newsletters? Want to be a hero, but don't want the recognition? We just learned about a website just for you! JustGive is a website for nonprofits that provides an easy platform for charitable giving. Visit wwwjustgive.org and look for the icon on the homepage that allows you to "Give Anonymously". We support JustGive.org and encourage you to use them. We have received anonymous gifts through them AND since learning about the site, we have used it as a resource and have learned a lot by using their online services. Maybe you will too! Through out the year volunteer workdays are scheduled so that citizens who love to use the preserve and its amenities can give back by working to take care of the resources at Hemlock Bluffs. It doesn't have to be a special day of service for folks to pitch-in and lend a hand to spruce up the trails, gardens, bridges or boardwalks. Of course, loads of volunteers come out on National Trails Day and National Public Lands Day every year to assist staff in ongoing trail and on-going preserve projects. It's great fun to volunteer with friends, family and other trail enthusiasts! For most of the year-round volunteer workdays, it's recommended that you bring work gloves and wheel barrows if you have them. It's also a good idea to wear sturdy shoes or boots, and work clothes that can get dirty. Bring a water bottle as well. 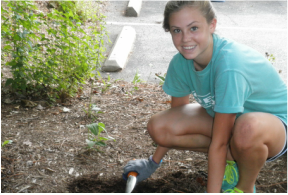 Find out about upcoming dates and times, visit classweb.townofcary.org. Pre-register through the Town of Cary. Call (919) 387-5980 or visit classweb.townofcary.org. Visit the Friends of Hemlock Bluffs' Facebook page and "like" it. Keep up with what's going on at Hemlock Bluffs! We'd love to see what you see when you visit Hemlock Bluffs Nature Preserve! Share these addresses with your friends and let them know about the Friends of Hemlock Bluffs! Click the "Support Us" button and enter the on-line shopping portal called "Shop to Support". You can do your normal on-line shopping safely and securely through our website while supporting the Friends of Hemlock Bluffs! With no additional charge to you, a percentage of your purchase will come back to the Friends, just because you used our website's access to the many vendors who agreed to provide a small kickback as a charitable gift. Think about this throughout the year and especially at the holidays! And, thanks for your support.